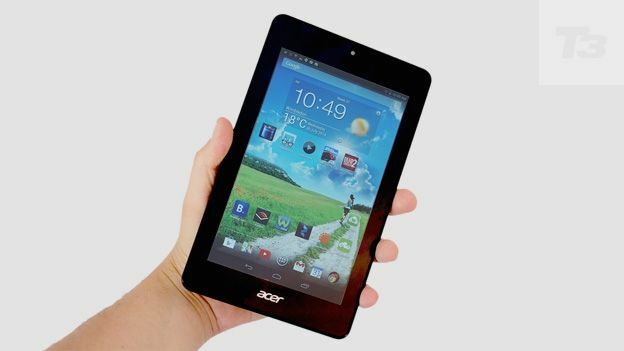 We find out what £100 gets you in an Android tablet in our Acer Iconia One 7 review. A Nexus 7 killer or a dud? What you can expect from a super-cheap Android tablet has changed radically over the last couple of years. A while back, cheap Android tablets used to have dreadful screens, laggy performance, and often didn't even have basic Google services like the Google Play app store. The Acer Iconia One 7 shows how far we've come. It's not perfect, but for those on a strict budget it makes a pretty capable little family tablet and sells for as little as £90. The Acer Iconia One 7 is a fairly small tablet, similar in size to the Nexus 7. With a plastic back and a glass front that's nowhere near as tough as the Gorilla Glass you get on a high-end tablet, it's not going to wow you as soon as you get your hands on the thing. Acer has also chosen to give the Iconia One 7 an odd contoured pattern on the back, but as the actual finish is just hard plastic without the soft touch feel you get in some tablets, it still feels a little bit cheap. Even if it is grippier thanks to the patterning. The Acer Iconia One 7 is not iPad-grade stuff, but in pure practical terms it's actually quite good. It weighs just 340g, and is small enough to hold in one mitt unless your hands are small. It's bigger and heavier than something like a Kindle Paperwhite, but it'd be handy to use on public transport on the way to work. There are 16GB and 32GB models of Acer Iconia One 7, and 16GB gives you enough room for a few high-end 3D games and a handful of movies. There's also a microSD card slot on one edge for extra storage. It's an exposed slot that has all the grace of a spotty teenager dive-bombing in a council swimming pool but we're glad it's there. As well as missing out on that super-expensive feel, the Acer Iconia One 7 doesn't have too many flashy features. There's no IR transmitter or mobile internet, but for the price it gets all the major boxes ticked impressively well. Real basics like Wi-Fi and Bluetooth are here, and so is GPS, which often used to get left out of cheaper tablets. One extra we'd like to see is wireless screen-casting, now that so many TVs support it. But it's no great loss, and 95 per cent of people wouldn't use it anyway. You get more than enough to do justice to Android here. If anything Acer has overdone it a bit in some respects. There are loads of preinstalled apps, including those from Acer and Amazon. Too many? Probably, but you can at least uninstall some of them. But really – why would you preinstall a booking.com app in a tablet? Sadly, the old Android 4.2 software used here doesn't let you file away naff apps like this into folders in the apps menu, just the home screen. There's no getting away from the appy bloat entirely. Aside from the pretty uninspiring design, it's the screen that shows up quite how cheap the Acer Iconia One 7 is. The two sacrifices are resolution and colour. It's a 7-inch 1,280 x 800 pixel screen, the same sort of display we saw in the original Nexus 7 from back in 2012. That's a long time ago in tech terms. Pixellation caused by the fairly low 216ppi pixel density means you don't get the pristine look of a higher-end tablet, but it's really not all that bad. Try hard and you're able to see those little pixels, but it's not as blocky looking as the larger, lower-res Gigaset QV830. For £90, you really can't complain too much. What's a little harder to get used to is the Acer Iconia One 7's colour reproduction. Colours are weak and washed out-looking, and as a result the screen doesn't really shine even in the best conditions. Other elements of the screen are a lot better, though. The Acer Iconia One 7 has an IPS display, the kind that provides the great viewing angles you get in most tablets. True to form, angled viewing is no major problem – you lose some brightness from an angle but you can still see what's on-screen easily enough. The Acer Iconia One 7 doesn't have the recessed look of some cheaper screen either. It's almost pretty good – but only almost. Still, don't go in expecting a supreme display and your eyes will get accustomed to the slightly drab colours soon enough. The Acer Iconia One 7's cameras too are limited. Very limited. We almost wonder why they bothered having two when a single half-decent camera would prove more useful. You get a rear 2MP camera without a flash and a front 0.3-megapixel video chat camera. They are both extremely noisy, the front one to the extent that it's borderline unusable in the sort of low-key lighting you might have in your lounge. Unless you have a very old phone indeed, you'd be much better off using your mobile to take snaps than relying on the Acer Iconia One 7. Not every part of the Acer Iconia One 7 screams compromise, though. You get a dual-core Intel Atom Z2560 1.6GHz processor with 1GB of RAM. A dual-core chip may not sound too impressive when almost every device seems to have at least four cores these days, but those cores count for more than those of other non-Intel tablets at this sort of price. There's a decent amount of power on tap here. General performance isn't 100 per cent lag free, but any slow-down is minor and when games work they perform well – even the high-end 3D ones you might expect not too work too well on a £90 tablet. We say 'when games work' because we had an unusual amount of trouble getting some of them working. Games freezing at load screens is pretty common with the Acer Iconia One 7, and at best load times are pretty long. We imagine this being down to games not being as optimised for Intel tablets as they are for more popular processor types. Gamers need patience, and would probably be better off with even the old Nexus 7, let alone the 'current' 2013 model. Battery life of the Acer Iconia One 7 isn't quite up to that of the big tablet players, but it could be worse. We got eight hours playing a 720p MP4 file on loop with medium brightness. It's good enough for a long flight. That's actually more than the seven hours Acer claims. However, we did also find that battery level dropped like a stone when playing 3D games, suggesting that perhaps the Intel Atom brain at the core of the Acer Iconia One 7 isn't quite as efficient as some others. You will still get a handful of hours off a charge even when playing 3D games, though. The Acer Iconia One 7 is a basic tablet that offers pretty good value given you can get one for as little as £90. If you can afford a bit more, the extra expense is worth it, but as a basic family tablet this is a decent buy.